Professor Ui-Tei completed her Ph.D. at the Waseda University Graduate School of Science and Engineering in 1987, and in the same year became a research fellow at the Mitsubishi Kasei Institute of Life Sciences. Starting in 1989 became an assistant, then a lecturer, then an associate professor at the Nippon Medical School’s School of Medicine. In 2002, she became an associate professor by special appointment in the University of Tokyo Graduate School of Science’s Department of Biophysics and Biochemistry, then in 2006, an associate professor in the same department and an adjunct associate professor at the Department of Bioinformatics and System Biology, the University of Tokyo Graduate School of Frontier Sciences. She took up her current post in 2007. The genetic information of organisms—their genome—is recorded using base pairs in that the organism’s DNA sequences. That information is copied to RNA, which functions to translate it into proteins necessary for creating life. 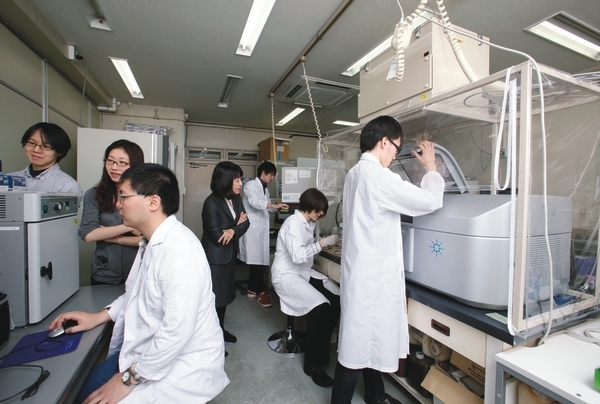 The main theme of research at the Ui-Tei Laboratory is uncovering the mechanism of gene interference due to microRNA and small RNA, both types of noncoding RNA. While “normal” RNA has a length of several thousand to several tens of thousands of base pairs, microRNA has only a few dozen, yet they are responsible for suppressing the expression of hundreds, even thousands of genes. It is interesting to consider the large role that such tiny objects play in increasing the complexity of life. Professor Ui-Tei says she is after original research that is unbound by convention, and has emphasized that in her experiments. In the past, she has shown through experimentation that RNA plays an important part in maintaining nerve cells. This was even before RNA’s diverse functioning was widely known. Research is a combination of experimentation and thought. When your research isn’t producing any results, that’s when it is most important to reexamine your goals for experimentation and information analysis, and to ensure that your approach is well suited to your goals. Bioinformatics is a new academic field. “It’s an area with many unknown domains, making it wonderfully challenging,” says Fuminori Murakami (M1). “It’s one where I feel like I can make discoveries, ahead of veteran researchers.” New fields of study offer greater opportunities for excelling on an international scale. 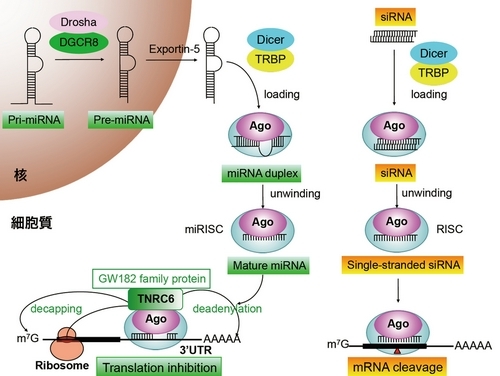 The molecular mechanism of RNA silencing. The diagram shows RNA silencing due to microRNA (miRNA) and small interfering RNA (siRNA) in a mammalian cell. “She gives us many opportunities for presentations and discussion, which helps me feel how much I’m growing.” (Sotaka Suzawa, M1).